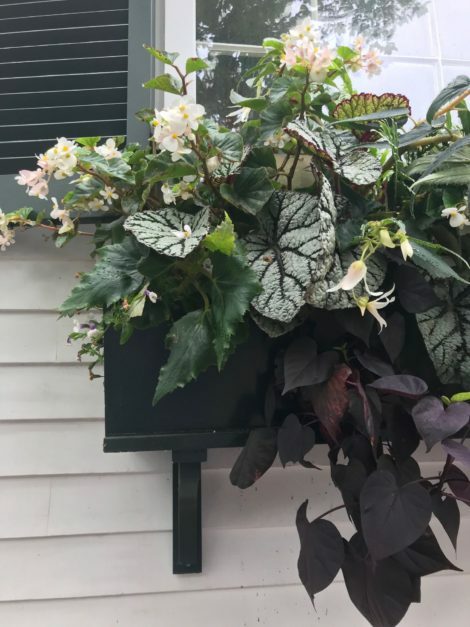 Silvery begonias, white flowers, and purple sweet potato vine in this beautiful Nantucket window box seemingly invite one in for a relaxing summer drink. For years, the color wheel seemed to be at the center of garden design. 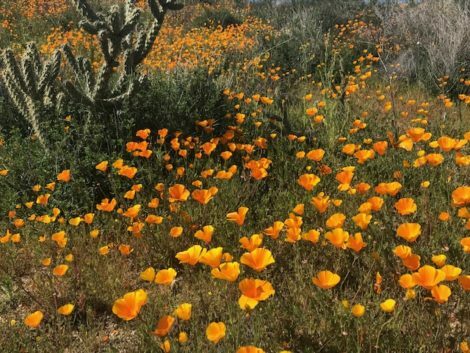 Gardeners were trained to select complementary or contrasting colors that would give the desired effect of calming or exciting the senses. 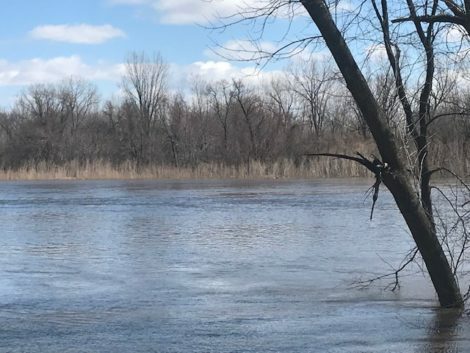 However, in the past few years, that approach seems to have been left behind as prairies, meadows, and naturalistic plantings show colors that appear at random in plantings that feel almost as freeform as their color schemes. 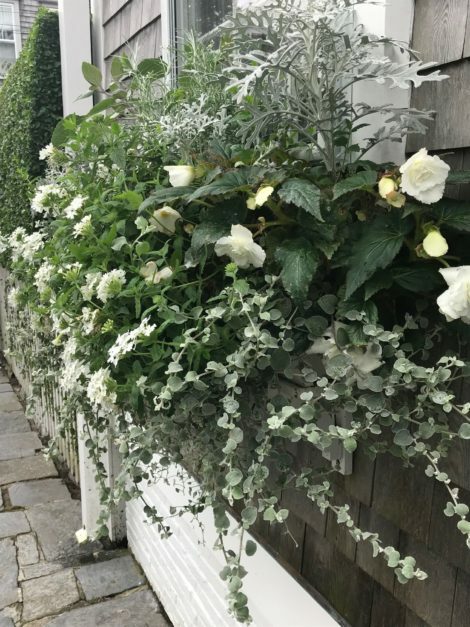 During my recent visit to Nantucket, I have been admiring the wonderful planted window boxes. 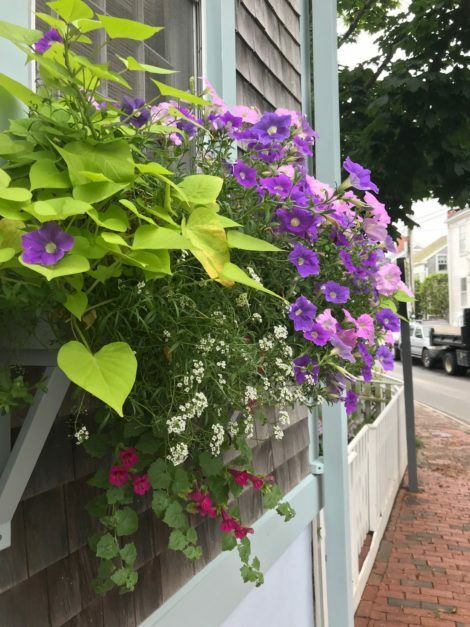 I can’t say whether the style on Nantucket is lagging behind or a little bit ahead of the curve (depending on your politics and beliefs in how fashion is moving forward), but the window boxes on this idyllic island seem to have a definite approach to color, and it was soothing to my senses on a much needed vacation. 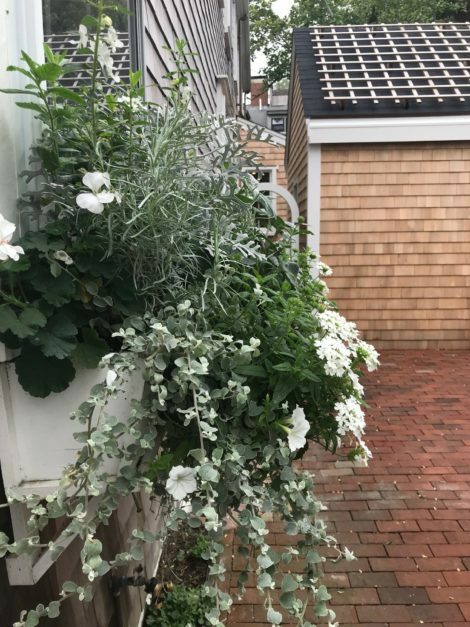 Dusty miller, white begonias, and some silver helichrysum remind me of my mother dressed for a summer dinner out at our summer house, replete with the silver lipstick that was in vogue at the time. I found myself drawn to the overflowing boxes that seemed to fill almost every window on the island. 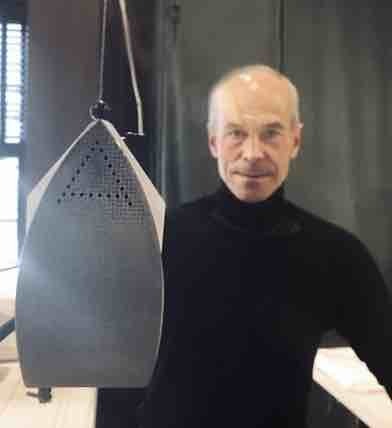 Each felt like it had been selected, like the right outfit (equally of importance to summer residents on the island), to express some aspect of the gardener’s personality. 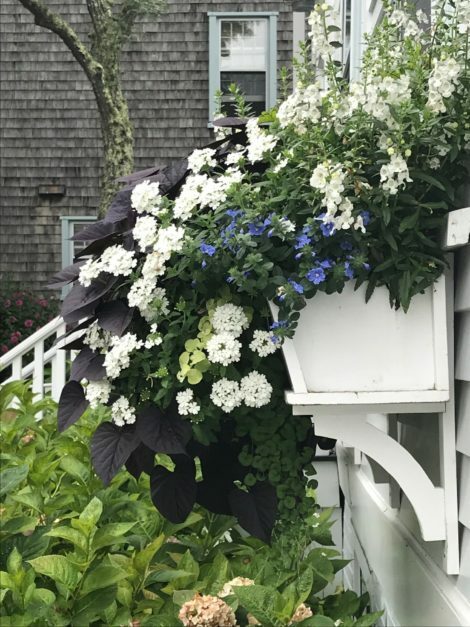 Some were simply the classic blue and white of an island retreat, adorned with a little silver ponytail (Dichondra argentea) that hung down like a piece of old jewelry and that added luster to an favorite old outfit. Others had a little more boldness in their tones and showed off favorite colors, like the deep purple and silver of a fancy leaved begonia, perhaps displaying a flashiness that some might say meant that they were trying too hard, but I found these boxes welcoming and cheerful nonetheless, like a young hostess having her first big cocktail party. Sometimes a little over-exuberance is just what we need. Sometimes a little color is just what is needed and has a welcoming tone all of its own. But a soft palette is also charming. 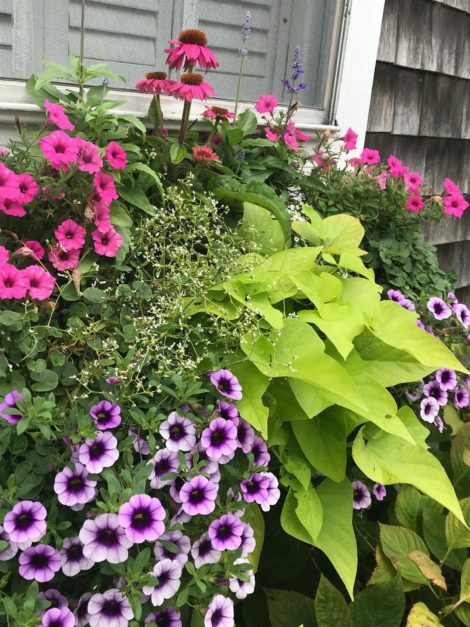 Perhaps what was so welcoming about all of these boxed plantings was their sense of containment and the way they flowed forward, reminding me that summer is a time of abundance and of the overwhelming force of nature doing its thing. There is an explosiveness to the season that helps us find energy and rebuild our own strength after a long period of hard work in the previous seasons. 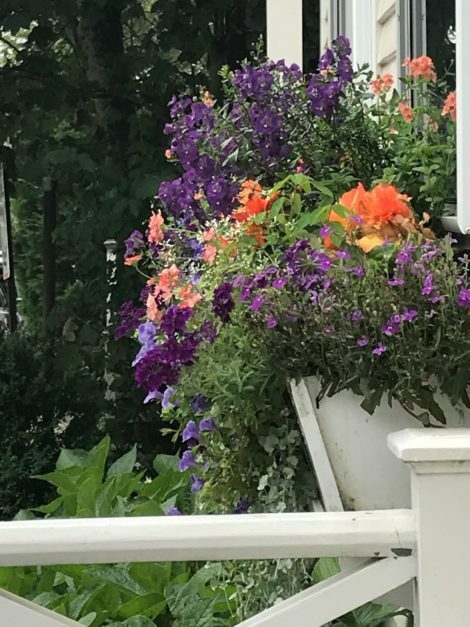 Something about containers spilling over with ivy and variegated Cuban oregano and annual flowers reminds us that the hard work we have been doing does pay off and eventually overdelivers, while we sit back and take it all in. Silver and purple never seem to go out of style in the right combination. A little touch of gold foliage might seem brash or might just feel like a day taking in the sun at the beach. No matter what color scheme or planting approach, each of the boxes energized the streets as I walked about visiting with friends and taking in the sights, and they also reminded me that, contrary to current fashion, a little planning and forethought about what was being presented paid off handsomely. A lesson we could all use, in our gardens, and when presenting ourselves at our own front doors, or at the doorsteps of one another. Never underestimate the cheeriness of too much color. Think Pucci or Lilly Pulitzer.